From the excellent book of Nobel Price winner Daniel Kanehman Thinking, Fast and Slow, an excerpt on how we usually overestimate the role of CEOs and underestimate the role of luck in much of what happens in our lives. This excerpt is about CEOs and companies, but the book contains much more insights and observations about us that come from the work of Kanehman. This book is a must read. Venture Deals: Be Smarter Than Your Lawyer and Venture Capitalist by Brad Feld and Jason Mendelson, this book describes the role of VCs, how an entrepreneur should deal with them (the General Partners) and what it means to raise VCs money. The Business of Venture Capital: Insights from Leading Practitioners on the Art of Raising a Fund, Deal Structuring, Value Creation, and Exit Strategies by Mahendra Ramsinghani, this book describes the world of VCs from the perspective of the Limited Partners (LP) and the General Partners (GP). this two books complement each other and give a great perspective on how the VC system works. We have all the Q4 earnings reports, so with the results come some of the discussions on how the smartphones competition is evolving. According to Horace Dediu, at Asymco Apple and Samsung captured about 90% of all available profits in the mobile phone industry. 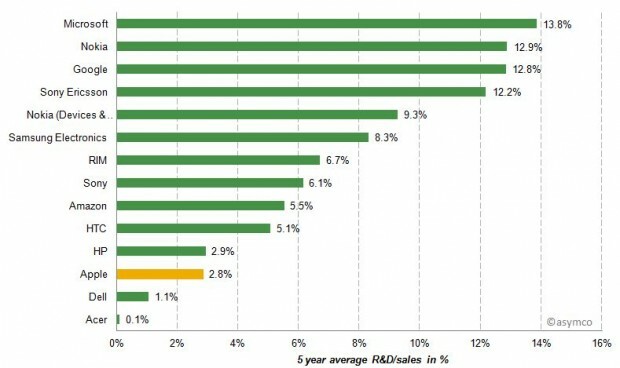 Then comes RIM third at 3.7%, HTC fourth at 3.0% and Nokia last at 1.8% of a $15 billion total for the quarter. 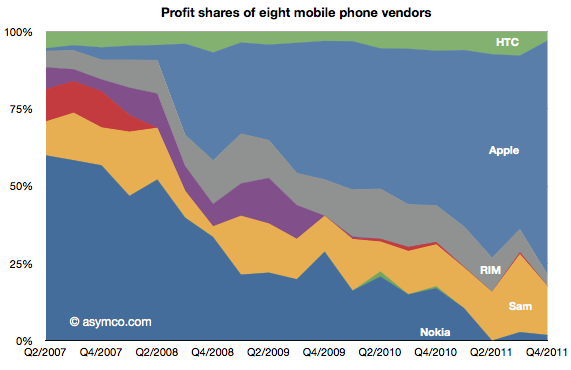 See the post First: Apple’s rank in mobile phone profitability and revenues. Smartphones are experiencing double digit growth, but a few are reaping all the profits with the rest lagging behind and even posting losses. HTC Profit Drops for First Time in Two Years on Mounting Phone Competition, and posted its first quarterly profit decline in two years as competing models from Apple Inc. (AAPL) and Samsung Electronics Co. damped demand for its handsets. For the year 2011, according to Canalys, the total smartphone shipments reached 488.0 million units, up 63% on the 299.7 million shipped in 2010. Apart from the numbers, it would be interesting to understand why so few winners and so many losers. Samsung smartphones use Android, Bada and Windows Phone, mainly Android though. And Apple uses its own iOS platform. Both the modular platform (Android) and the vertical approach (Apple iOS) seem to be doing very well. And proprietary (relatively old) platforms Symbian and BBOS (RIM) are suffering from the innovation of the newer platforms. But even vendors using Android are struggling to remain competitive and to differentiate even though the platform is experiencing an incredible growth. Then there is the Windows Phone OS, fighting for relevancy, now stuck at 1.4% market share in 2011. However, Nokia is now introducing several new handsets with this OS and the Nokia Lumia 900 has just won the best phone at CES , 2012 will be an important year for Microsoft and for Nokia. And while profitability has been greater in the smartphones segment, according to Tero Kuittinen Feature Phones Now More Profitable Than Mid-tier Smartphones. Android is growing but in Q4 has lost market shares, mainly in North America, Tero Kuittinen Nielsen Numbers Bad Indeed for Android, RIM and if carriers sells more heavily subsidized iPhones they are in trouble too, as AT&T’s profitability deteriorated as more than 80% of its smartphone activations were now taken over by the heavily subsidized iPhone, see Tero Kuittinen Android Share Dive Aftershocks. What should smartphones vendors do to remain relevant? Create their own platform? Use a modular or a proprietary vertical oriented approach?